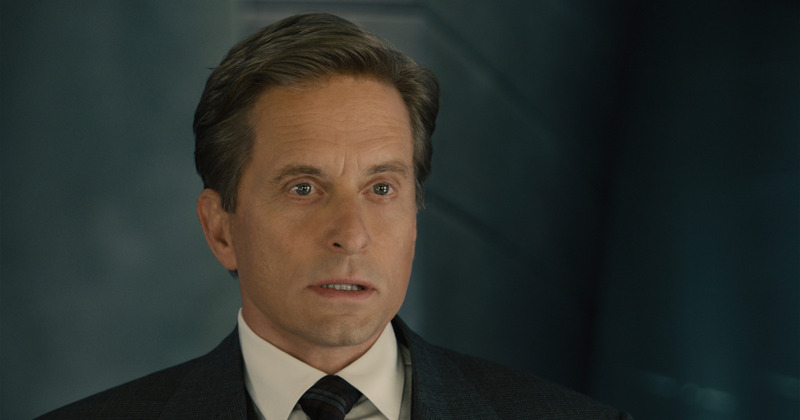 In the 80s and 90s, using a secret shrinking formula, Hank Pym (Michael Douglas) operated in secret as the Ant-Man. Nearly thirty years later, Hank’s protege and all-around evil dude Darren Cross (Corey Stoll), has taken control of his company Pym-Tech and seeks to perfect the shrinking technology and sell it to the highest military bidder. Using his daughter Hope’s (Evangeline Lilly) position in the company, Hank orchestrates a heist to destroy Cross’s prototype suit and formula. 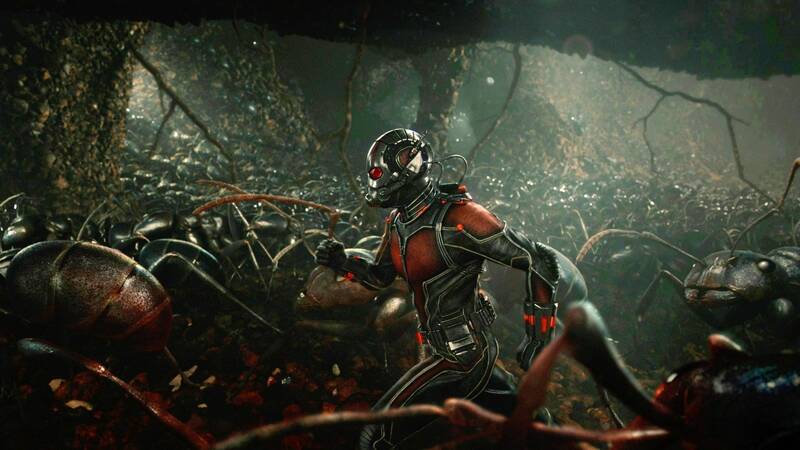 But to succeed, he must rely on a new Ant-Man: down-on-his-luck ex-con Scott Lang (Paul Rudd). Unlike Phase One, the MCU’s Phase Two ends not with the spectacle of an Avengers team-up. Instead, it ends with the introduction of a new hero to the canon, who, if rumors are to be believed, was originally slated to start the MCU instead of Iron Man. Ant-Man, while liked, is not one of the MCU’s most frequently vaunted films. However, it was the one movie I was really excited to show my mom, because I thought she would really like it. And boy was I right! She was on board by the first few minutes, where a flashback introduces an early SHIELD and scientist Hank Pym, with Marvel’s first application of the digital fountain of youth (later revisited in Civil War and Guardians Vol. 2). A lot of people criticized the youthification of Michael Douglas, citing that it didn’t look real enough. Well, maybe it’s due to my mother’s ever-worsening eyesight, but she was rightly fooled (he looks pretty good in that still up there). Her first words were “Oh, that looks like Michael Douglas.”. Upon me explaining that this was, in fact, Michael Douglas, she was astounded. She really likes him and thinks he’s “a great actor”, so this locked her in almost immediately. Flashing-forward to the present, the movie introduces us to a stable of memorable characters including old Michael Douglas (“Oh, that’s what he really looks like.”), Kate from LOST (“I didn’t recognize her with the hair”) and, of course, Paul Rudd (“He’s funny.”) And this is where Ant-Man really works its magic. The overall plot is nothing special: a genius inventor wants to stop his evil protégé from perverting his technology; so the real appeal of the film rests on the shoulders of its characters, and they do indeed deliver. 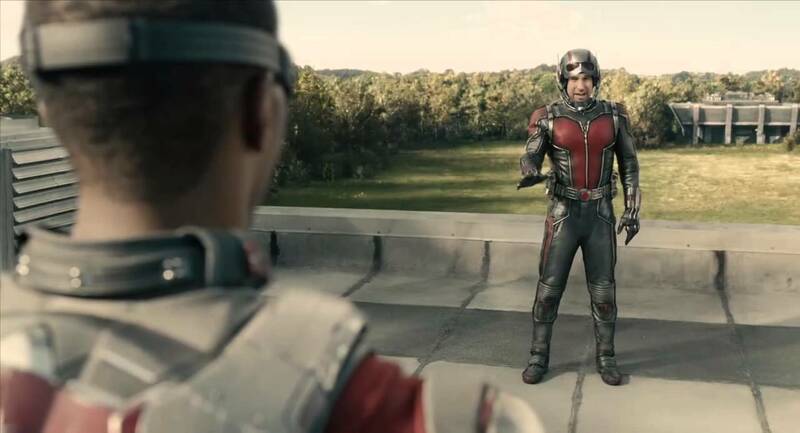 Scott Lang is set up as a sympathetic criminal, along with his doofy criminal buddies played to delicious and hilarious perfection by David Dastmalchian, T.I., and show-stealer Michael Pena. Now let me pause for a second to talk about Michael Pena’s Luis. My mom loved Luis. Every time he was on screen and speaking, she was laughing. Michael Pena’s on point delivery and physical comedy is a real gem. He’s just having so much fun with it! My mom often says she watches and enjoys these movies, but can’t remember a thing about them afterwards, but Luis made such an impression on her, I doubt she’ll forget him. However, she doesn’t remember his name, but always calls him “crazy guy”, which is apt. While the characters do carry the film, the execution of the plot is done very well, too. Like I said, it’s a simple plot, but as a result, the step-by-step unfolding of the pieces of the heist and the Ant-Man technology gives the film a lot of room to breathe, establish its world and concepts, as well as letting us get acquainted with the characters and their relationships, unlike Guardians of The Galaxy which did not provide my mom (or me, to be honest) with time enough to stop and appreciate it. 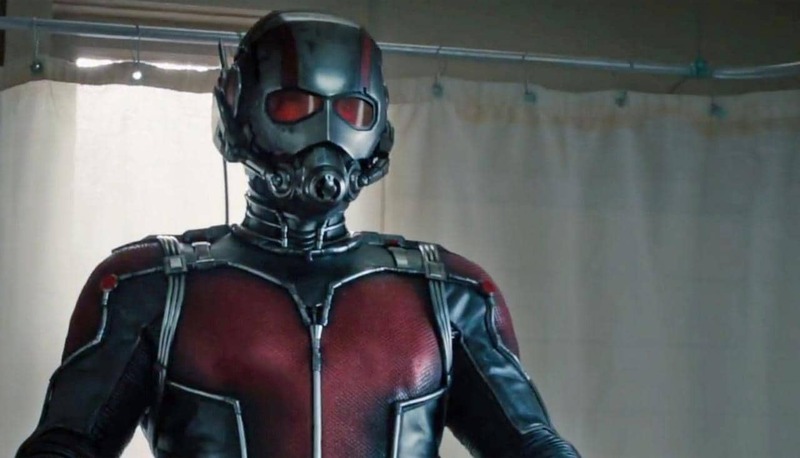 Ant-Man also works well since it functions as a heist movie first and a superhero movie second. The macguffin is clear, everyone’s motivations are clear, even if simplistic, and every inch of the scheme is laid out in a very accessible way, as is necessary for a standard heist movie. Even when it gets crazy, introducing the different kinds of ants and their skills, at no point does it feel at all overwhelming. Is Ant-Man a perfect movie? Of course,\ not. It has a few issues. Once again, my old adage is that a Marvel movie is only as good as its villain. Corey Stoll’s turn as Hank Pym’s evil protégé Darren Cross is a bit flat and simplistic. He’s merely a re-skin of Jeff Bridges’ far superior Obadiah Stane character from the first Iron Man: a twisted version of the hero (Hank, in this case) bent on selling advanced technology to the highest bidder for nefarious purposes. However, since Ant-Man is a heist movie first, the villain can be as caricature-like as possible. I mean, look at Ocean’s Eleven. Andy Garcia’s just a generic dude who’s not even particularly evil. So Cross gets a pass from me. Especially since my mom latched on to him as unambiguously evil, and there were no complex shades of grey to deal with. Ant-Man’s second sin comes in the form of an action sequence that was clearly tacked on to establish his co-existence in an Avengers universe. Scott Lang’s fight 09with Anthony Mackie’s Falcon at the Avengers facility in upstate New York (a far cry from the film’s San Francisco setting) interrupts the otherwise solid flow of the film with a side mission that serves little-to-no purpose. I don’t know what Scott had to steal from them or if the thing even shows up again, which makes it a very poor Chekov’s gun. If Marvel Studios’ forcible inclusion of this scene was the reason Edgar Wright walked off the movie, I can’t really blame him. That being said, it was still a fun scene and my mom enjoyed the inventiveness of the fight sequence, so it’s certainly better than it has any right to be. Ant-Man is mom gold. It’s a very easy film to get into with a charming cast of characters that doesn’t take itself too seriously and is all the better for it. Unlike Guardians of the Galaxy, my mom was laughing all the way through, and gave it the coveted designation of “very funny”. She thought it was the “best of Phase 2” and that they “made it very nice”. While I’m not so sure about the former, I can definitely agree with the latter. That’s right. SIX out of FIVE. Deal with it, nerds. She was very happy that Ant­–Man didn’t have “too much violence”. Since I went to Georgia Tech, she found it very funny that the villain was called “Yellowjacket”. I’m just surprised she remembered my college mascot. Now that Phase Two is done, we’re going to take another brief break for the holidays, and so that my mom can start on Season 2 of The Crown. She loves The Crown. If you’d like me to cover how my mom feels about Season 2 of The Crown, let me know and I can start up “Make Mom Your Majesty”.